Bad habits are a common threat to success in the lives of so many young Africans but I have good news for you. It is not too late to identify and change your worst habits and immediately starting living a successful life. To reach that desired success, you must change your bad habits. The first step to change and success is the awareness that you actually need change. Carefully examine your life now, identify those negative habits and start changing them immediately. Don’t let the bad habit of procrastination stop you. Millions of young Africans out there have mindsets and attitudes that propel them for failure. As young Africans, we need to know that our bad habits will determine our future meaning that with your current habits you can predict your own future whether it will be a success or total failure. The math is simple, successful habits create positive results while negative habits will definitely create negative consequences. Ignore good habits ignore excellent success. Javnyuy Joybert is a Social Entrepreneur, Empowerment Coach, Public Speaker and a dynamic, prolific and strategic Entrepreneurship/Business Management Trainer/consultant and a personal efficiency strategist. He is focused, question asker, answer seeker, problem solver and purposeful young African. He is the Founder/CEO of The Center for Entrepreneurship, Leadership and Business Management Development (CELBMD) Africa – The Pan African Professional Center. 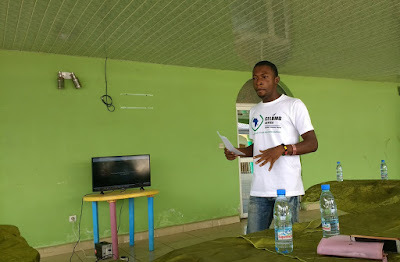 He is the Head of Njorku Career Centers, Country Director Consultant for C-Life, COO of Most Influential Young Cameroonians Initiative, YALI RLC Fellow and Consultant with several community base organizations, NGOs and SMEs across Africa. He has been nominated and has worn several local and international awards. He is the author of How to Confront The Limits (Living a More Impactul Life) – 2015, Living a Life of Divine Purpose – 2016, The Principal Things for African Young People – 2017, and Guide to Manifesting Purpose -2017. He has authored so many personal development articles that have been published on several blogs and online platforms across Africa reaching thousands of audience weekly. He has lectured Business Management courses in two private universities in Cameroon for 5 years (2012-2016), He is A World at School Global Youth Ambassador and has been featured on numerous publications across the world regarding his contributions to mother Africa.